Romantic looking! The pearls look like floating on your skin. Inspired by the movie “Tin Cupâ. The larger and smaller sized pearl alternation style gives you the stunning sophisticated texture. A piece that can be worn from day to evening date, parties. Top quality pearls! 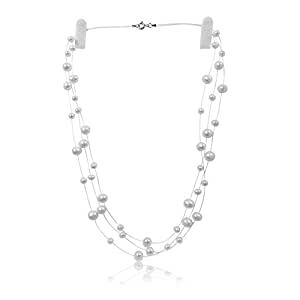 High luster, very low blemish pearls are hand picked by our pearl experts and used in this necklace. All metal parts are 14K white gold over solid sterling silver. No nickel used, no allergy issue. One year risk free guarantee. Wait to see her smile! Presented in Pearls N Silver Fine Jewelry custom box that keeps the necklace in store showroom effect. Perfect present for wedding, graduation, birthdays. What is the most asked question by Our Customers? How to tell fake pearls from real pearls? To answer this question, first we need to clarify the 2 types of âreal pearlâ – natural pearl and cultured pearl. The best way to describe it is: itâs like wild salmon and farmed raised salmon. Natural pearl = wild salmon and cultured pearl = farmed raised salmon, meaning the pearl bearing oyster (for ocean pearls) or mussels (for freshwater pearls) are farmed raised by human.. Almost 99% even 100% of the real pearls you see in a store are cultured pearls. Fake pearls or initiation pearls in the pearl industry are pearl-like objects made by human with materials such as glass or mother of pearl beads then coat with pearl powder or other subjects in an effort to make it look like a cultured/natural pearl. Now we can come to the part of how to tell the fake or real pearl. The easiest way is the tooth test. If you grind your teeth along the pearl surface and feel gritty or sandy, this is a real pearl. If you use a knife to grind the surface of a real pearl, you will see some powder gathering. This is some pearl nacre scraped off the pearl surface. If you wipe it off the pearl, you donât see much damage with you eyes. Although under magnifying glass you will see some damage on the surface. If your teeth slide off the hard surface like sliding along the surface of a glass, and if you grind hard enough, a clear line of permanent mark will be left. There will not be any powder residue left at the end of the knife if using a knife. Of course, if the pearl is of much importance, you should not use this method and should give it to a specialist to find out. Brought to you by Pearl N Silver Fine Jewerly- Gemological Institute of America Alumni. Look Good, Feel Good with Pearls N Silver Fine Jewelry! Check the details by hovoring your mouse over the picture above.